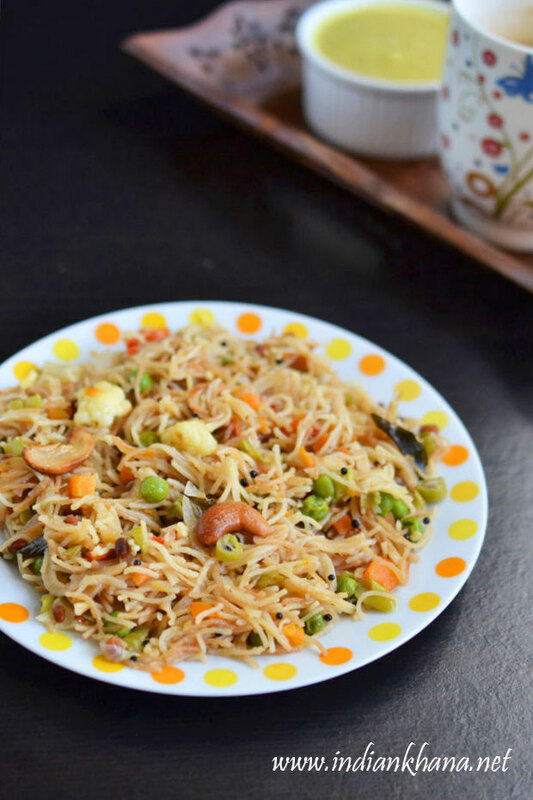 Vegetables Semiya Upma or Vermicelli Upma is popular South Indian breakfast recipe and almost all love semiya upma and adding vegetables only makes it more delicious and healthy. 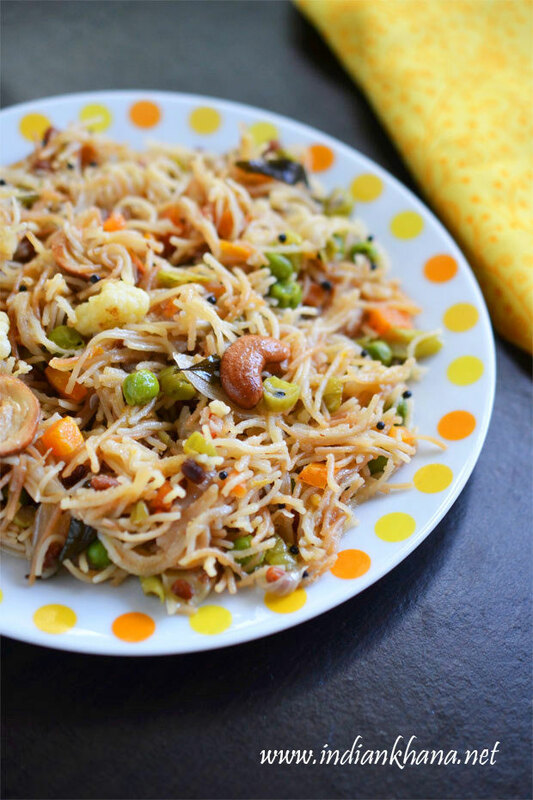 Semiya, Sevia, Seviya, Sevai, Shavige upma/uppittu whatever we may call it this is one of those recipe that we can have as breakfast, lunch, dinner, snack or even it suits perfectly for lunch box. I love semiya upma but DH is just opposite it doesn't like anything that has upma word with it! So I make this for myself and my brother if not serving him upma and for myself along it's mostly serve as lunch other than breakfast and during our schooling days it used to be lunch box for us. That's the wonder of this delicious semiya upma serve as any meal of day and it still charms all. You can add any vegetables of your choice and also use ghee instead of oil for rich flavors, it really taste yum if we use ghee or top up the upma with a little ghee, also some people add a pinch of turmeric with water you can do that to get yellow color upma if preferred. 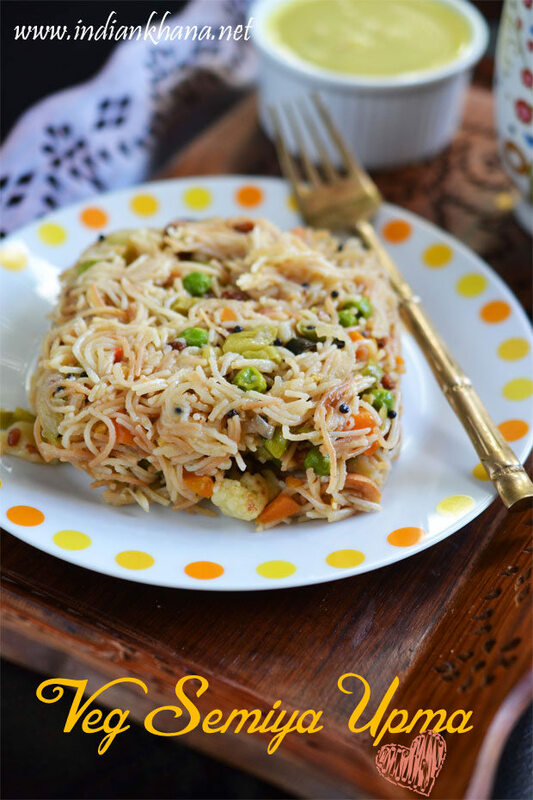 For now straight to the recipe and I am sure you will like this semiya upma too if you haven't tried it so far. 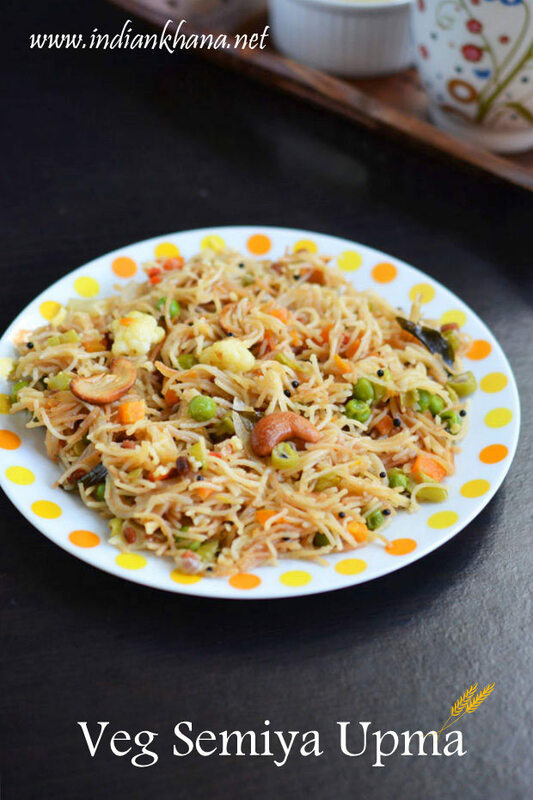 Popular breakfast recipe Semiya (Seviyan) upma with loads of vegetables. Peel and slice onion, finely chop green chili, carrot, beans, cauliflower, coriander leaves and keep aside. Heat a pan or wok and dry roast semiya/vermicelli until golden brown in medium flame, keep stirring to avoid semiya from getting burnt, keep aside. In the same wok or pan add oil and heat, add mustard seeds and allow to splutter. Add urad dal, curry leaves, ginger and get dal gets brown. Add cashew nuts and saute for 30 seconds. Now add onion, green chili and saute until onion becomes light brown. Add carrot, beans and cook in medium flame for 2 mins or until they are half done, now add cauliflower, cook for a minute. Add peas, mix and cook for 2 mins. Add water, salt and bring it to boil, simmer for 2 mins to make sure all the vegetables gets cooked but doesn't get mashed. Add roasted semiya and mix well, cook until all water gets absorb and upma becomes dry, do this in medium to high flame to avoid semiya from getting mash. Add coriander leaves mix and off flame. You can replace cashew nuts with peanuts. After you add semiya in water, keep stirring to avoid upma from forming lumps and semiya not to get mash or over cook. You can use ghee instead of oil for richer flavor or in the end after you off flame add little ghee mix and serve. 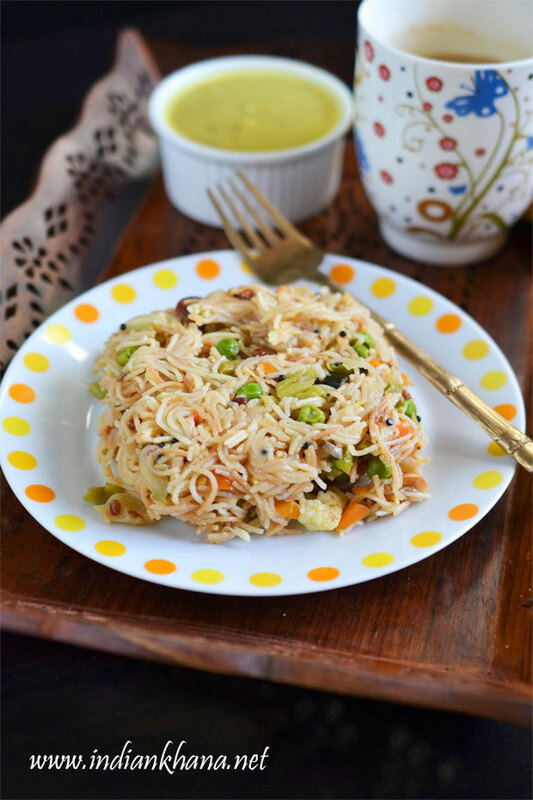 Delicious semiya upma with loads of vegetables.